The Roslyn School District is proud to announce that 56 students were selected to participate in this year's annual Nassau Music Educators Association All County Music Festivals. Students were selected based on scores achieved at NYSSMA festivals last spring, and from music teacher's recommendations. 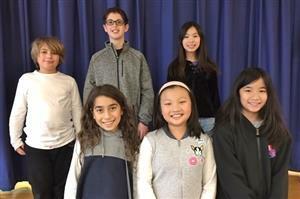 These students represented the district in concerts at the Tilles Center in January. Roslyn High School All County Division 4 (Grades 9 & 10) - L-R Top: Leah Arbitman, Lindsey Russ, David Fried, Emma Dalessio, Sophie Gerson, Saydie Grossman, Alexa Weinberger. L-R Bottom: Owen Edelstein, Daniel Liu, Shane Elias, William Xu, Kenny Kim, Cary Drucker. Missing: Luca Guillon, Samantha Berg, Logan Mastromarco & Morgan Sapienza. Roslyn Middle School Division 3 (Grades 7 & 8): Top row (l. to r.) Liam McHugh, Max Rubrum, Eli Klein, Steven Schwartz, Tyler Turetsky, Jack May, Jadyn Lee. Bottom (l.to r.): Aureeb Ahmed, Ashley Kim, Lila Freifeld, Sophia Lee, Julianna DiBartolomeo.